THIS PLACE HAS EVERYTHING! SOUTH FACING SPLIT 2 BEDROOM FLOORPLAN. ENORMOUS, 45 foot long BRICKED IN TERRACE FOR GRILLING, TOTALLY REMODELED INTERIOR WITH HARDWOOD FLOORS, OPEN KITCHEN WITH GRANITE COUNTERS, WOOD CABS, STAINLESS APPLIANCES, SLATE MASTER BATH AND STONE TILED 2ND BATH, GREAT CLOSET SPACE! READY FOR SUMMER ENJOYMENT! DEEDED PARKING AVAILABLE FOR $38,000 EACH. Bldg has 3 sundecks, fitness center, 2 laundry rooms, storage and bike room. Assmt includes: heat, air, cable, internet, water & bldg amenities. Pet Restrictions: Cats OK, Dogs OK, / 25lbs. 480 North McClurg Court #313, Chicago, IL 60611 (MLS# 10141832) is a Condo / Townhouse property with 2 bedrooms and 2 full bathrooms. 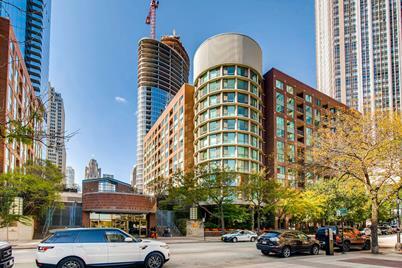 480 North McClurg Court #313 is currently listed for $449,000 and was received on November 20, 2018. Want to learn more about 480 North McClurg Court #313? Do you have questions about finding other Condo / Townhouse real estate for sale in Near North Side? You can browse all Near North Side real estate or contact a Coldwell Banker agent to request more information.